Each Setter who enters our program is placed in a foster home. 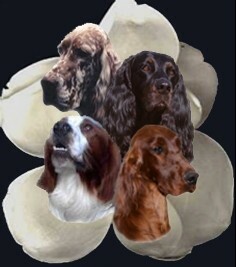 The foster parent takes the Setter into their home as a member of the family, obtains medical evaluations and any needed treatment, and evaluates the Setter's temperament and needs. Oftentimes senior dogs or those with extensive medical issues are adopted by their foster families. Prior to adoption, all dogs are spayed or neutered, vaccinated according to local requirements, tested for heartworms and parasites and treated if needed, and microchipped. Our adoption process requires an application, veterinarian reference, and a home visit. We require that all of our dogs be house dogs; Setters do not do well being outside-only dogs. Setters are active dogs and need to run, and for most, a fenced yard is needed to provide a safe area for exercise. Our adoption contract requires that the dog be returned to our program if the placement does not work out or if circumstances change during the life-time of the dog that prevent the adoptive family from keeping the dog. An appropriate home for each dog is preferably sought locally. Please be prepared to drive to pick up your new family member or meet someone part way. We will make every effort to make this convenient for you, but the dog is always our priority.